All of your viewing and transactions are safe. 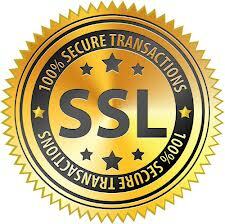 SSL is the standard security technology for establishing an encrypted link between a web server and a browser. Notice the URL or Address Bar you should see a Green Lock icon indicating the page is safe and secure. This encryption ensures that all data passed between our web server and your browser remain private and secure. This means that your visit to our website and purchases will load securely via HTTPS, rather than insecure HTTP. Our Shopify shopping cart system utilizes the SSL encryption once you initiate a purchse from our website.